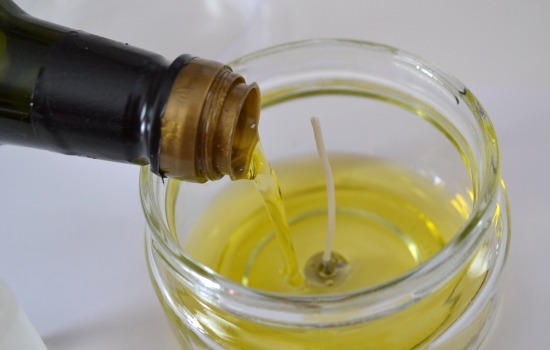 DIY Quick Candles Using a Kitchen Staple! You just might be surprised the kitchen staple we’re going to be using to make some quick candles today! I had been previously pondered that perhaps I should get into making candles. There was a very sweet realtor that I used to work with who one day was diagnosed with cancer. While this is always tragic news, it was even worse because as an independently employed person, she had no health insurance. 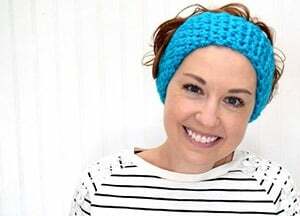 In order to pay her medical bills, she began making and selling candles. I always admired her spirit and never considered making my own while she was still selling them. By the by, I hear that nowadays she’s in remission and back selling homes instead of little pots of linen scented wax! Now while going through the aisles I remembered something else. One Christmas Momma bought my sister, a heavily pregnant family friend and myself a soap making kit to occupy some idle time over the holidays. We were really excited about it and it wound up being tragic with burned eyes and whatnot. I’m not even sure what went wrong, but when dealing with that sort of craft I kind of have some issues to work through and I’m not quite there, yet, which makes me a bit nervous to make candles though I really want to. So I found these little snippings of wick that said something akin to “put me in vegetable oil!” I liked the idea but decided to go traditional in appearance rather than having little floating flames. 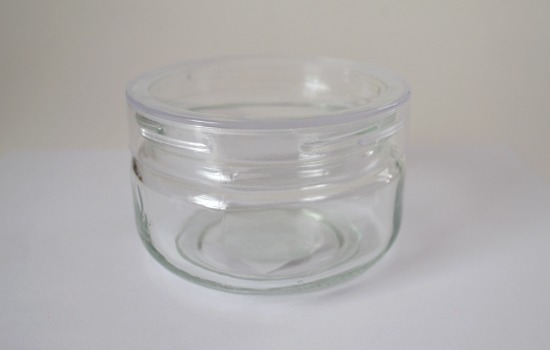 First you’ll need a nice little glass jar. I went small so that I wouldn’t use tons and tons of oil. I also spent a good deal of time removing and replacing the lids on these jars (the lady stocking the shelves looked at me like I was such an idiot amused by lids of things!). Remember that this thing is going to be filled with OIL. Which will be nasty business if it gets knocked over or your cat decides go all detective on you to bat at it. Also remember that liquids slosh around. If you have to really work and turn the jar all around to open it, you’re going to have another problem on your hands. Now I understand what density means, but have no idea what kind of role the viscosity or density or whatever of the oil would play with the wick. Would it float or stay where I put it? 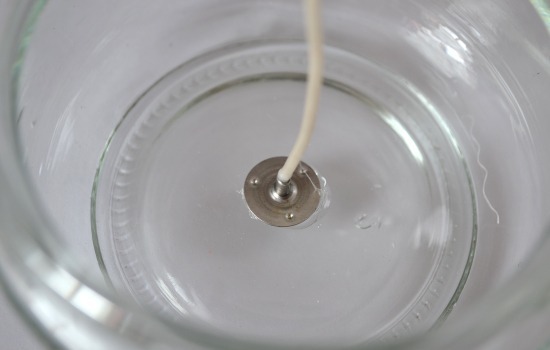 I decided to bet on float which is why I hot glued the metal portion of the wick onto the bottom of the jar. 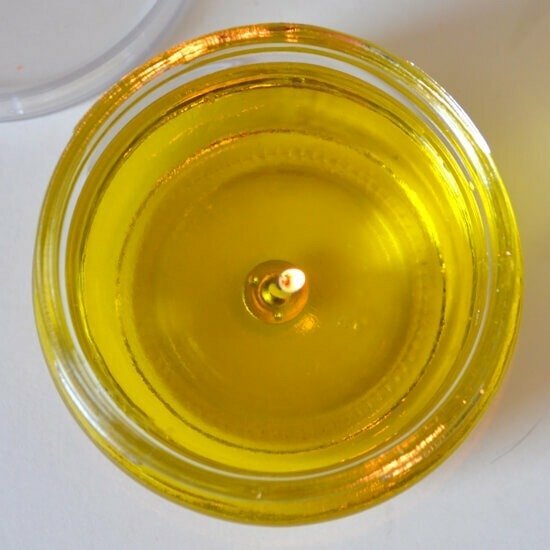 Mix some candle scent into your oil to get it all lovely smelling. I used a mantastic cologne type of scent because I adore the scent (although I’ve never actually dated a cologne wearer, hmmm). I went ahead and put quite a bit in and gave it a bit of a stir. 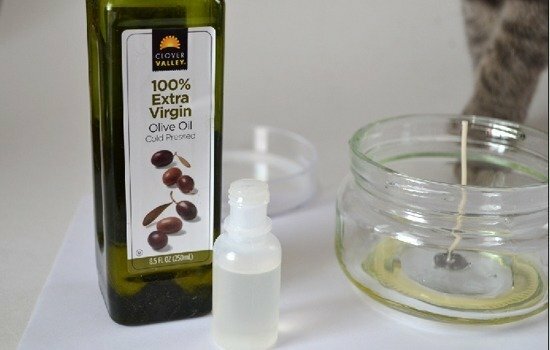 I used some olive oil I got from Dollar General because I had gotten it to do this thing called “oil pulling” which I did only once and for 5 minutes rather than the full 15. So basically I had a considerable amount of this stuff on hand and it isn’t the olive oil I like to cook with so it needed a use, anyway. 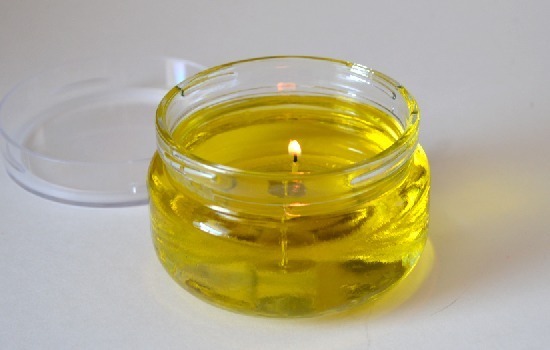 Pour your oil into your jar and trim the wick to be just a bit taller than the level of the oil. To light, I used a wood skewer I set fire to because I couldn’t figure out how to light it with a traditional lighter. Remember that oil is flammable so take care when lighting and allowing to burn in your home. The neatest thing about this little candle is that it casts some very interesting halos of light around as the light from the flame goes through the oil. It truly is very nifty. Now, I can’t say how well it scents your home because I also managed to scent myself when I accidentally got some on my hands and apparently, this stuff doesn’t wash away so well! Awesome idea! I'm going to make some. Thanks for sharing. So clever and the post is hysterical ! !